Varun Sayal is a fellow you like to get connected with. As far as we know him, he is a straight forward and genuine person who is a foodie too :). Well, only these are not the important attributes of him. He is a fantastic writer with a genuinely good imagination. I remember a conversation with my late grandfather during which he mentioned that it requires a lot of skills to be an author or a writer, but imagination is something like a special ability; some are blessed with it. Varun writes in Sci-Fi genre. Now, there are a lot of attributes about this genre which keeps a lot of readers and reviewers a little away from it. The author needs to balance both “SCIience” and “FIction” elements. While imagination is required for “fiction” segment, one needs to do a moderate level of research to make the “Science” part convincing. Fortunately, from our team, I got a chance to read Varun’s previous book Time Crawlers and I liked it. Here is a detailed book review for the same. 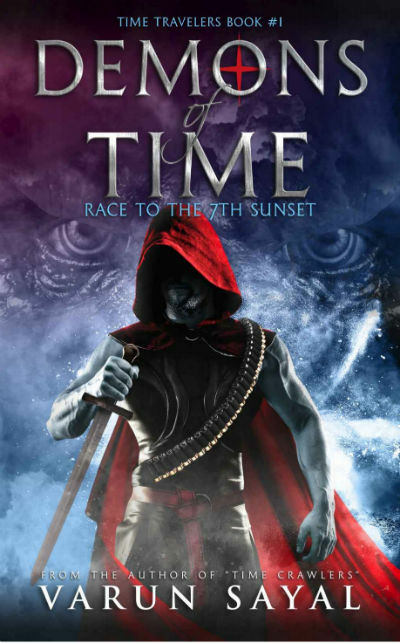 So, when Varun approached with his second book Demons of Time: Race to the 7th Sunset (Time Travelers Book 1), I was really curious to read it. And, I read it out of its turn. And, here are my personal and unbiased views for this book. Our regular readers know that we believe in the philosophy of “not judging a book by its cover” and at the same time we recognize the influence of a cover page on reading and/or purchase decisions as well. So let us take a look at the cover page of this book. I consider it as a challenge to design a cover page for a SciFi, especially when the title mentions words like Time, Demon and Time Traveling. The cover page is quite interesting. Though, it looks little more unreal than it should. The colors are balanced and the title is readable. I will consider it a decent one which has a scope of improvement. It all starts in dark time when a mother was running alongwith her son so both of them can escape the danger lurking behind. Two of the most powerful time-demons with incredible abilities and brutal nature were trailing them, and it is impossible to ditch them. And, on a fateful moment, it happened! The demons almost captured them and were in conversation among them so they can decide the course of brutality to shower on their captives when a sage entered the scene. Later we came to know that he was known as Guru Rigu. Rigu was not an ordinary sage (of course, no sage ever has been ordinary, but he was exceptionally skilled one, one of the best among the sages), with so much of scientific exploration and meditation, he has achieved abilities which might look unreal. He established an ashram where many learned sages and students were exploring and experimenting with many things. The most important one is a group of skilled disciples who can look through time and can focus on a specific time and place. They can see what is to be happened in the future, and with this knowledge under the guidance of Rigu (or mostly Rigu) try changing the course of actions for the greater good of the humanity and the world. This knowledge helped Rigu come to this scene on time, or otherwise, time-demons can just slip to any time, any place and can take any form and it is almost impossible to track them again. But, as said earlier, Kumbh and Vetri were also among the most skillful time-demons, so will they overpower Rigu and just escape with the captives? And, even if they are captured, how to keep them as a prisoner? As they can slip in a fraction of second to anywhere, at any time. Well, you need to read this book to know more. And over the course of incidents you will meet Kumbh, Vetri, Rigu, Dhara, Tej, Trikaaladevi, Manika, Gajendra, Samarth Bhasin, Kevin, goons, criminals, smugglers, security forces, private armies, secret keepers and passers, and… many more. The book is good in many aspects. While it remains true to its genre, it tries to explore various aspects of Indian mythology as well. And more importantly, it does it nicely. The names of the characters are chosen wisely. If you pay attention you find the attributes of the characters reflects their names. While Gajendra is a muscleman with the brain, Manika is nothing less than a jewel,… rest of them, I will leave for you to explore and be amused. The author brought in the concept of time travel and using black holes as a key element there quite nicely. In fact, the concept of time demon is USP of the book. The way the author has explained the abilities of some time demons to remain in multiple verses at the same time and do their work is fascinating. With rugged dark green trousers below, he was naked from the waist up. A long necklace made of human and goat skulls was hanging around his neck. In his right hand, he clutched a huge, shining metal hammer stained with old, dried blood. Vetri was not much of a thinker, because his brother did most of the planning for both of them. While it is said that scripting humor is the toughest job for a writer, exploring emotions is not lesser. And, when you need to weave it with realities of the life it gets challenging. Here are the lines form the book which I like as it weaves emotions, realities, philosophy, sadness, and hope altogether. … He stopped eating and cried for days. No one was able to console him. But the sun still rose every-day and brightened the sky. The raindrops still fell, and the crops still bore grain. The world moved on, and he did, too. The simple way in which a teacher convey an important knowledge to a curious student is explored in the book effectively. The author references a recent supreme court (India) order in the story very nicely. Many of the readers will be able to establish a link between. In the same context, the author puts in some wise dialogs in a prime character’s mouth, which are worth understanding. At what point of time in history did humankind start traversing a path of self-annihilation? Instead of doing good for the world, humans designed weapons which could decimate populations within minutes. Here are some more interesting lines from the book. … but a gory war was a cost of the bloodless peace that followed. … But experience has taught me that even the strongest armor can be pierced through with the sharpest blade. You didn’t like me educating you? I can understand. Kids usually find their parent’s valuable teachings useless. Having seen the technologies of the future, the past looked like the Stone Ages. This was a war, and in a war, there is nothing right or wrong, nothing righteous or immoral. It’s two sides fighting for victory. That’s it. In fact, I loved the fact that I hated this fight in you. Or I hated the fact that I loved it. An uncontrolled car nailed him outside his house four days and ten ago. Do you think that something is not right in the following block? I think so. So the book has its hits and misses both. Also, the concept of AD/BC is mentioned by a sage living in ancient times. Of course, we understand that he has witnessed past and future along with the present, but the first reference of the words came in when it was referred to a young fellow living in old age. For him, the words shouldn’t mean anything. At least until he learns about the future. I really enjoyed the climax war, especially the technique used by the antagonist to avoid being overpowered by the protagonist, and the logic applied by the protagonist to counter it. I like the way the author explored briefly (yet effectively) the effects of altering a timeline. I love the analogy of experiencing the death of a loved one and the feelings of knowing loved one never existed. Simply brilliant. There are many other aspects of the book which are worth talking about; but, it will contain spoilers and it will ruin your reading experience. So, let us keep it as much spoiler free as possible :). Truth is like that bitter drink which looks appealing when in the glass, but when ingested, only brings pain and sorrow. From various quotes mentioned above, you should have got an idea about the quality of writing you can expect in the book. The author took care of building characters and giving them the required footage. It is more challenging than you think. It is obvious to lean towards the protagonist (and at some level to the antagonist) for the author and give him/her more strength and scenes. And eventually, it leads to giving less footage to other characters, which makes the overall store unbalanced. The author kept the things in balance here. There are some minor details mentioned in the story at various levels, and you may think that it is just to keep the things more realistic and detailed, however, no piece of information remains un-utilized till the climax :). By the way, the end of the book tells you that a sequel is coming, so get ready for it :). Definitely a good Sci-Fi short novel. If you love this genre, then you will find the book quite entertaining and gripping. The way the modern world is weaved with the mythological stuff is effective. The book has more positives then letdowns.